In preparation for a gathering with brothers and sisters to meditate on the last words given by the Messiah on the cross, I read this booklet. 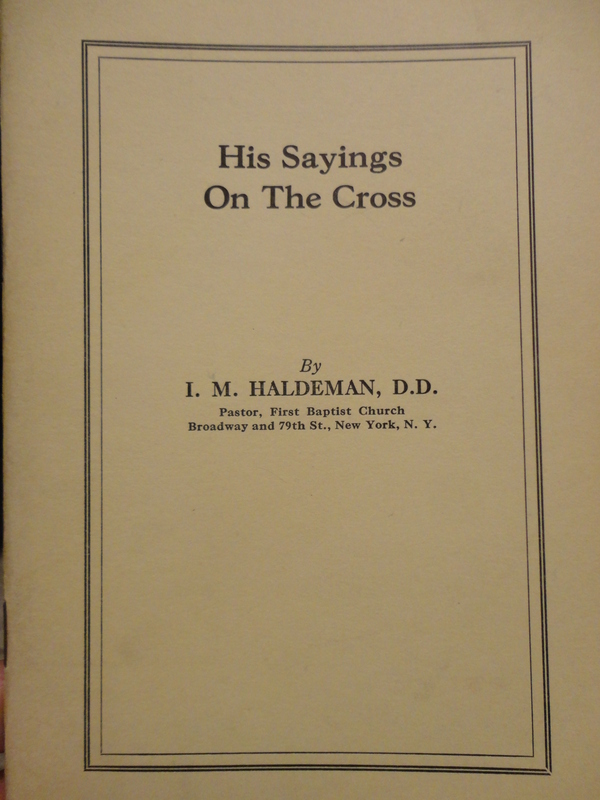 Haldeman focuses on eight sayings (splitting the words to Mary and John) of Jesus. Concerning statement #2 by Jesus, “Verily I say unto thee, Today shalt thou be with me in paradise” (Luke 23:43), the author notes how important it is to have the correct placement of the comma. I will not discuss the proposition made by a certain class of teachers, affirming the comma should not be placed after the pronoun, “thee,” but after “today”; so that the sentence then should read: “I say unto thee today, thou shalt be with me in paradise.” This is intended to teach our Lord did not tell the thief he should be with Him that day in paradise, but rather to draw attention to the fact what He was saying, He was saying on that day. The attempt is so wholly unintellectual, such a betrayal of exegesis, such an open and Satanic trick to deprive the Christian of the assurance of immediate departure to be with Christ, it carries its own refutation. The very moment of his death the thief was with the Lord. One misplaced comma can do a world of harm, yet we know to be absent from the body is to be present with the Lord. On statement #5, “I thirst”, the author emphasizes the spiritual thirst of the Savior. Here was the thirst of the cross, the thirst of the divine victim, thirsting for God His Father, for the overflowing of His love and fellowship. For this He panted when hounded by the sin of the world, the sin which leaped upon Him and held Him in its clutch till He felt the down sweeping fire of the inward consuming flame of God’s wrath shutting Him out from the infinite love that was as His very life. Set the word before your mind, do the best thinking you can, let your imagination run riot, you cannot reach even the shadow of comprehension of it. There is no possible comprehension of it in this world. The Messiah became the outsider so that we could become the insiders. It is the high and lifted announcement to all ears of the universe, proclaiming every believer in Christ – Out of debt. Yea, and amen, we are free. There is no charge against us in the Heavenly docket. There is no debtor’s prison for us. This entry was posted in book reviews and tagged Christianity, forgiveness, gospel, Jesus, the cross, the Passion of Jesus. Bookmark the permalink.